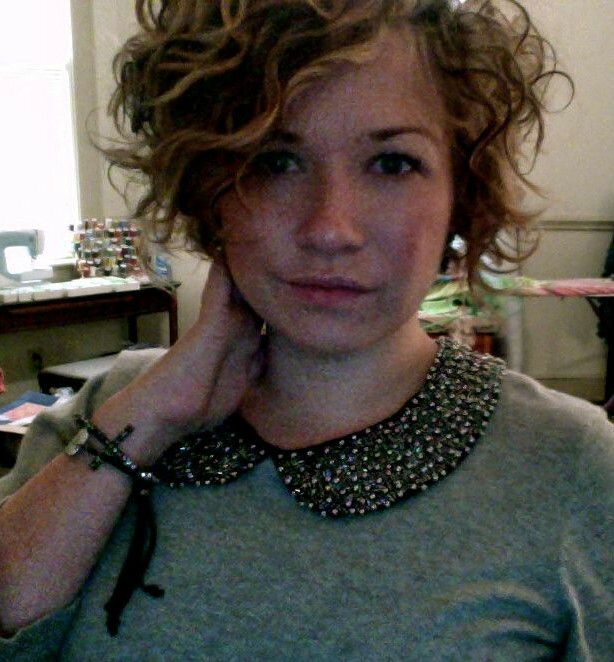 It's about me and some other stuff, but mostly crafty type things. Hello wedding season! It’s here. I used to think that “wedding season” wasn’t really a real thing, but now I’m at the age where I’m pretty affected by this mythical season. People in my age bracket (and older) are getting married like crazy these days. Over the past few years I have experienced this “not real” season actually being a very real thing. I know multiple people getting married in the next few months and have some personal involvement in a 2 weddings. For one wedding, I made the veil, and I’m actually in the other wedding (and doing some other stuff too, but you will find that out later). This blog is about the veil. The bride has a very, very beautiful champagne colored silk flower adorned with rhinestones to wear in her hair, but she wanted a little birdcage veil to go with it. She will take the veil off after the ceremony and just wear the flower. 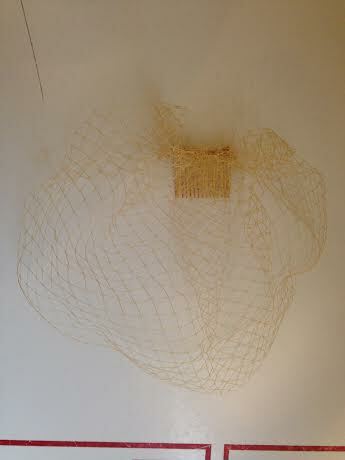 The only problem is that I couldn’t find champagne colored birdcage veil material. Well, I might have could have found it online, but I needed it quickly and I was apprehensive about matching the color. I’m always hesitant to order supplies. I like to feel them first. At home I had a few different colors of birdcage veil material on rolls. I had white and ivory, but both were too light for the flower and the dress. My goal was to dye them, and I did….with COFFEE! I found various places online that had how-tos on dying fabric with coffee. I read a few instructions and then of course did my own thing. I brewed coffee in my Keurig. 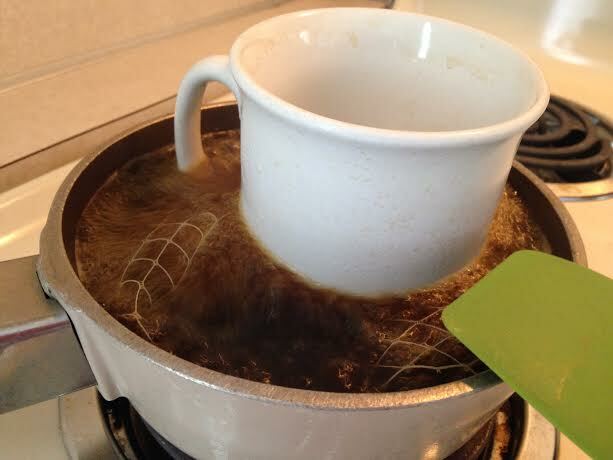 After I made 2 big cups of coffee I put them in a pot on the stove and brought the coffee to a boil. I submerged both pieces of fabric into the pot and then I weighed them down with a coffee cup to keep them under the liquid. I let them sit in the boiling water for about 10 minutes and then I turned the stove off and let them sit for about 5-10 more minutes. After I took the fabric out of the pot I washed it in the sink with dishwashing detergent and cold water. It was very exciting to see that the color had taken to the veil fabric. I then laid out my pieces to dry. I placed a cup on all the corners as I stretched the fabric out. It got a little wrinkly in the pot. Both fabrics dyed well, but the one that was originally ivory ended up being the best color match. 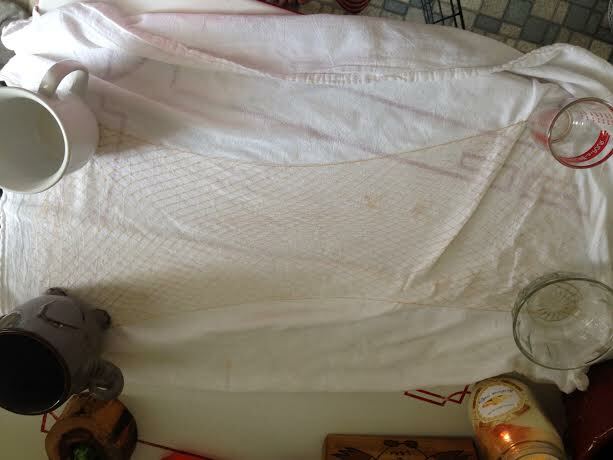 The white fabric absorbed more of the coffee color and ended up being too dark. I then took the rectangle of fabric and sewed a weaving pattern through the holes around three of the sides. I pulled the thread and I scrunched the fabric together to create a bunching on one side and a roundedness on the other. I made sure the scrunched side of the fabric was the same width as the width of the hair comb. I then sewed the scrunched side of the veil to the comb. This particular comb is a fairly pliable metal. I like to bend them a little bit so they lay flat against the head. This comb also has holes along the top that make it easy to sew the veil to. Here is the finished veil. You actually stick the comb forward in your hair, which almost seems backwards. Then the veil is like a little bubble over the front part of your head. 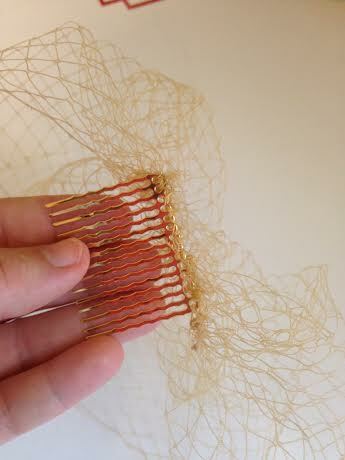 Sometimes when you wear them it is necessary to place a few strategic bobby pins to hold the net exactly like you want. 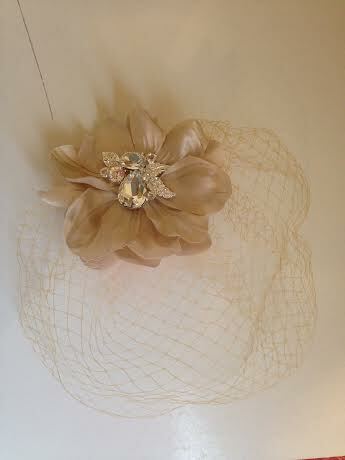 This veil is to be warm a little to the side with the flower hooked near the clip. It is so lovely and classic looking. I’m glad the birdcage veil has made a comeback!